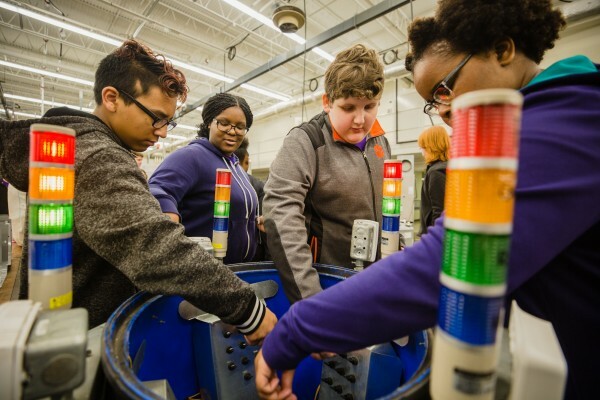 Eighth-graders across Sumter School District middle schools had the chance to learn about the advanced technology used in the manufacturing industry at the third-annual Manufacturers and Technology Expo. Organized by Sumter Economic Development, The LINK Economic Development Alliance and the South Carolina Department of Commerce, the event featured a full day of hands-on, interactive STEM activities, displays and showcases at multiple Central Carolina Technical College campuses in Sumter that showed students how manufacturing jobs they can eventually get right here in Sumter use curriculum they're already learning in the fields of science, technology, engineering and math. According to the Department of Commerce, South Carolina, once focused on textile mill and apparel jobs, now is focused on its diversified industry of manufacturers, including leading the nation in the export of sales of tires and passenger vehicles. Over the last 10 years, the Palmetto State has averaged manufacturing employment growth of more than 18 percent, which ranks second in the Southeast.